you are right, but usually you should prevent scalar functions and replace them by inline table value functions. Things becomes now a little bit complicicated. When I test it with your script (inserting in #temp3 / #temp4) on SQL2017, it is slower than the schema bound scalar function (64 vs 32 ms CPU and 2000 ms vs 3 ms total run time). But this happens only, because the insert goes parallel and has to spool / wait / whatever for this. With OPTION (MAXDOP 1) or when I just select the data (and not insert it in a new temp) I’m back to the schemabound scalar values. 100% get rid of the scalar functions when you can…and if you can’t, then use SCHEMABINDING :). And your last line sums up every belief I have about SQL Server. I’ve not tested the code from this particular article but will. While the article is well written, it has a major fault for testing… you MUST NOT use SET STATISTICS when testing Scalar or mTVF functions. It seriously skews the results. It’s ok to us against iTVFs but not Scalar or mTVF functions. Please see the following article for more information on that subject. Thanks for link Jeff, I never knew of SET STATISTICS TIME’s significant impact on CPU time when dealing with scalar functions – is this something you’ve seen documented by MSFT? I found some references to older versions of SQL Server, but couldn’t find anything current (https://support.microsoft.com/en-us/help/931279/sql-server-timing-values-may-be-incorrect-when-you-use-utilities-or-te). I reran my code using your testing framework several times and fortunately it still seems like WITH SCHEMABINDING provides about an order of magnitude better performance in these tests. Ah… to be sure, I wasn’t suggesting that WITH SCHEMABINDING wouldn’t work. It’s absolutely one of the best things to include in functions, Scalar or otherwise, for all of the reasons your good article mentions. I just didn’t want people to take the method of using SET STATISTICS to test Scalar functions away as method for correctly measuring performance when Scalar or mTVF functions are part of the test. Thanks for the comment Mike! I haven’t tested it, but I do not think you will receive a performance boost since SQL Server does not “analyze the body of CLR routines (https://msdn.microsoft.com/library/ecf5c097-0972-48e2-a9c0-b695b7dd2820). It does seem like you can set certain attributes like IsDeterministic, which may allow for some optimizations. Ran the code and a funny thing has happened… although the Schema Binding version does run faster, the table spool does NOT show up in the non-Schema Binding version for me. I’m running SQL Server 2016 EE on SSDs. Also, if I use varying data instead of fixed data, the differences in duration are much less. The only spool that I’m seeing is for the self join on the table that you’re using as a “Pseudo-Cursor” row-source and it appears in both execution plans. Same thing shows up in SQL Server 2008. I have no idea why there’s no spool associated with the non-Schema_Binding function because I’ve seen such a thing wrt other functions. I’m also finding that the differences are much less if the data that you’re passing to the functions is random (more like real data) than when passing a single value. If the data you used were in a table, it would have a cardinality of “1” and that can sometimes set a huge skew on the performance of some methods because SQL Server looks at it and says “Well, shoot… there’s only one real value in this table so I can take a shortcut”. I tried putting your and my data in tables and that doesn’t appear to affect such things here but it sure affects things in your original test. Again, I’m not even coming close to suggesting that people don’t use the SCHEMA_BINDING option. It would be nearly stupid to not include it especially in “calculation only” functions. I’m just interested in how the “Devils in the data” make things change for these types of things. Interesting findings, thanks for sharing Jeff! Ah… crud. Figured it out. Getting hard for me to see in my old age, I guess. The execution plans you posted weren’t for the original INSERTs into #Temp1 and #Temp2. They were for the UPDATEs that I apparently skipped right over (lordy… how did I miss those two lines of obvious code?). I’m going to play some more and try to get back to this with some code that might explain the huge difference in performance on the initial INSERTs. Again, using SCHEMA_BINDING is still the right thing to do. I’m just working on the “Devils in the data”. @Gavin Harris : Before we started using SCHEMABINDING we had breakdowns post-release. Someone would change a Table (say) and some little used function would be impacted, not found during normal QA and a long time later that would break in the field. Yeah, I question why QA didn’t find it, but such things happen. We have a house rule that SCHEMABINDING must be included in every Function, even if it is only as a comment to say “SCHEMABINDING not appropriate here” … but thanks to this article I ran a GREP and found half a dozen new ones that don’t – and, indeed, have no dependency at all so will get a performance boost. Is your scalar function accessing data? no, it just cut zero. CPU time = 1641 ms, elapsed time = 1859 ms.
CPU time = 1656 ms, elapsed time = 1840 ms. There isn't a significant difference between the two methods when the data is different for each execution. Actually, doing the static value in isolation explains why this works the way that it does…. 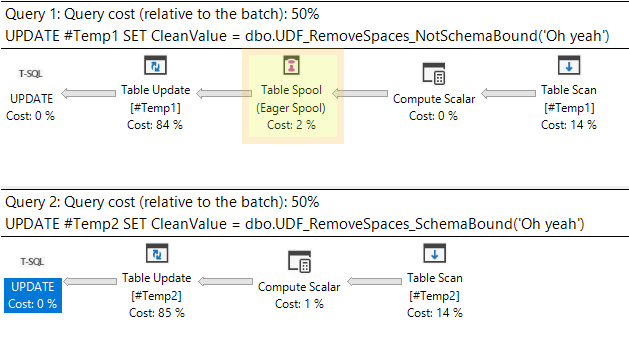 The UDF only executes once when it is SCHEMABOUND for the static value, this is not the case when it is used against a table column or actual row value which it has to evaluate and run the function row-by-agonizing-row. It’ll be interesting to see what they do when the finally release iSFs. Hi Jonathan, thank you for posting these examples! It’s nice to have an additional way to measure the performance of these functions. The last example you provide with the static value only being executed a single time is great – that’s a great optimization to see in action. While I receive roughly the same results as you from your tests, I do see the schemabound function consistently beating out the nonschemabound function by tenths of a second – not huge I know, but still the difference is still there. (SELECT * FROM master..spt_values WHERE number < 500) t1 CROSS JOIN (SELECT * FROM master..spt_values WHERE number < 500) t2; GO INSERT INTO #Temp1 (Col1) SELECT dbo.UDF_RemoveSpaces_NotSchemaBound(t1.name) as Col1 FROM (SELECT * FROM master..spt_values WHERE number < 500) t1 CROSS JOIN (SELECT * FROM master..spt_values WHERE number < 500) t2; GO SELECT OBJECT_NAME(object_id, database_id) AS FunctionName, execution_count, total_elapsed_time, total_worker_time FROM sys.dm_exec_function_stats WHERE database_id = DB_ID(); GO /* 10 executions UDF_RemoveSpaces_SchemaBound	5069440	6204886	3880687 UDF_RemoveSpaces_NotSchemaBound	5069440	6657444	4227097 */ DROP TABLE IF EXISTS #Temp1; DROP TABLE IF EXISTS #Temp2; CREATE TABLE #Temp1 (Col1 varchar(100)); CREATE TABLE #Temp2 (Col1 varchar(100)); GO INSERT INTO #Temp1 (Col1) SELECT dbo.UDF_RemoveSpaces_NotSchemaBound(t1.name) as Col1 FROM (SELECT * FROM master..spt_values WHERE number < 1000) t1 CROSS JOIN (SELECT * FROM master..spt_values WHERE number < 1000) t2; GO INSERT INTO #Temp2 (Col1) SELECT dbo.UDF_RemoveSpaces_SchemaBound(t1.name) as Col1 FROM (SELECT * FROM master..spt_values WHERE number < 1000) t1 CROSS JOIN (SELECT * FROM master..spt_values WHERE number < 1000) t2; GO SELECT OBJECT_NAME(object_id, database_id) AS FunctionName, execution_count, total_elapsed_time, total_worker_time FROM sys.dm_exec_function_stats WHERE database_id = DB_ID(); GO /* 5 executions UDF_RemoveSpaces_SchemaBound	7405445	8982437	5630147 UDF_RemoveSpaces_NotSchemaBound	7405445	9813539	6139276 */ The differences aren't huge in these examples, but the further I keep increasing the number of rows being processed, the further the results diverge.